The Camaro 1LE concept debuting in Las Vegas next week is based on the track-focused 1LE package from the third-generation Camaro, Chevy says. DETROIT – Chevrolet -- aiming to enhance consumer demand for two of its most popular models -- is readying a slew of special Camaro and Corvette models for the Specialty Equipment Market Association show in Las Vegas next week. "These are cars that owners treat as canvases to express their personalization and high-performance dreams -- and have been for decades," Chris Perry, vice president of global marketing and strategy for Chevrolet, said in a statement. "The SEMA show is the perfect venue to test new customization concepts and to inspire new owners to start modifying their cars." Chevrolet said the new "Ashen Gray" ZL1 Camaro will be one of the featured vehicles. "This is the top of the line for Camaros," said Dave Ross, a design manager for Chevrolet. There is carbon fiber in the hood, shifter and spoiler. 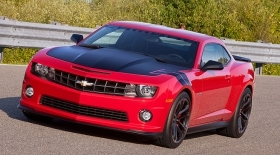 The Camaro ZL1 will go on sale in 2012, but this design with its multiple infusions of carbon fiber is still a concept. In addition to a new 21-inch wheel and a new stripe package -- both market-ready -- designers have recreated the grille of the vehicle for more stability at higher speeds, said Adam Barry, senior creative designer for the Camaro and Corvette. Alongside the ZL1 will be the Camaro 1LE Track Pack concept. "It won't take a lot of public appeal for consumers to get this," Barry said at a sneak preview event at the GM Heritage Center this week. "The Camaro 1LE concept is all about the track," Al Oppenheiser, chief engineer for the Camaro, said in a statement. "It's an all-out race car package that pays tribute to that special option from the past." Also on Chevrolet's list is the updated Camaro Synergy Series concept, with improved after-marking, striping, wheels, ground effects and unique seat stitching. "The Synergy Series takes the two (dealers and factories) and puts them together," Ross said. "It's what happens when the two groups work together." The Synergy Series package could cost consumers an estimated $10,000 extra. Enter the Camaro Red Zone. Although still a concept, the Red Zone is unique in that it blends current and future accessories, Chevrolet claims. "We wanted to have different tiers to our accessory package," Ross said. The Red Zone will offer various levels of accessory packages to interested consumers, in addition to the performance specs enthusiasts have come to expect of a Camaro, Chevrolet says. The brand also will have 18 sets of Camaro wheels at SEMA -- half of which are currently in the market and half still in development. Chevy also plans a Corvette Carlisle Blue Grand Sport Concept and Corvette Z06 Ron Fellow 'Hall of Fame' Tribute model. To celebrate Chevrolet's centennial on Nov. 1 and the Corvette's racing history, the Ron Fellows edition includes custom graphics and red stitching on the vehicle's interior to match its 'torch red' exterior. Ron Fellows was a race car driver from 1999 to 2007. The Corvette Carlisle, on the other hand, celebrates 30 years of "Corvettes at Carlisle," one of the largest annual Corvette gatherings in North America. It features a Carlisle Blue Metallic exterior similar to a clear day's bright, blue sky, as well as a body stripe package, unique Silver-painted wheels, full body spoiler and some carbon fiber accents. U.S. sales of the Camaro are up 6 percent this year through September to 70,249 units. Corvette sales are up 5 percent to 10,270. Chevrolet says variants of the subcompact Sonic and compact Cruze will dominate the cars and customized vehicles it plans to unveil at SEMA. About 60 percent of its models on display will be either the Sonic or the Cruze. The SEMA show will take place Nov. 1-4 at the Las Vegas Convention Center.